MoCCA Fest returns to NYC April 6 to 7th. Held at Metropolitan West (639 W 46th St.), MoCCA Fest is one of New York’s largest events for indie comics, zines, and animation with comics veterans and up-and-comers alike attending. Organized by the Society of Illustrators, this year’s guests of honor include Eisner-winning, Emmy-nominated artist Bill Sienkiewicz (Elektra: Assassin), cartoonist Liana Finck (A Bintel Brief), Edie Fake (Gaylord Phoenix, Little Stranger), and cartoonist Keith Knight (The Knight Life, (th)ink, K Chronicles). Drawing Across Borders: The Artists of Cartooning for Peace, is an exhibition of art and cartoons from the humanitarian and human rights focused cartooning collective. Displayed artists include Ares, Cristina Sampaio, Jean Plantu, Michel Kichka, Ann Telnaes, Patrick Chappette, Firoozeh Mozaffari, Emad Hajjaj, Damien Glez, Jeff Danziger, and Elena Ospina. The festival also includes industry panels, a RisoLab from SVA for those of you that want to dabble in Risograph printing, as well as after parties, and more. The arrival of spring in NYC means more sunlight, slightly warmer weather, and the return of the NY International Auto Show at the Jacob Javits Center. Running April 19 to the 28th, the NY Auto Show is a perennial favorite to see the future of the automotive industry. Chevrolet, Bugatti, Ford, Porsche, Fiat, Subaru, and more take to the stage to show high concept futuristic cars, the latest offerings, and more. Group tours will be available for those overwhelmed by the sheer scale of the events (and the M.C. Escher-esque layout of the Javits Center). Camp Jeep Ride & Drive will have a test course outside the Javits center for its line of Jeeps. One of, if not the, largest event in the American publishing world, Book Expo America is returning to the Javits Center on May 29 - 31st, along with its counterpart, Book Con on June 1 -2. Book Expo focuses on the industry side of the publishing world with panels and lectures for publishers, libraries, and book stores looking to grow. Educational sessions discuss topics such as the new wave of international fiction, the rise of graphic novels aimed at kids, how to perfect digital marketing campaigns, library e-book lending, how to raise a lifelong reader in a digital age, and more. Book Expo will also be sharing space with the New York Rights Fair for licensing international properties for books and more. Book Con is the consumer focused event with special guest authors and lecturers to meet and get autographs from including Adam Savage, Alyssa Milano, Brittney Morris, Dylan Thuras, Evangeline Lilly, Marie Lu, Frank Miller, and many more. Writing Workshops will help you aspiring authors to get that story that's always been in your head onto paper, while the Family HQ space is geared towards readers of all ages. 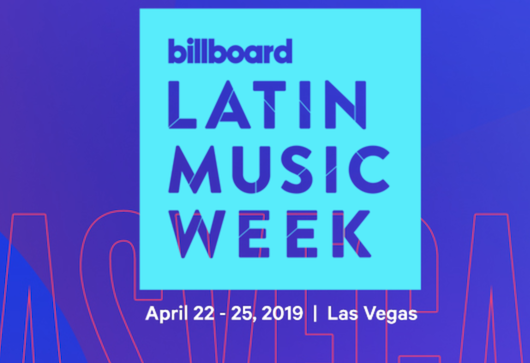 Latin music world converges on Las Vegas for Billboard Latin Music Week from April 22 to the 25th. Held at The Venetian Hotel (3355 S. Las Vegas Blvd) Musicians and industry professionals will be meeting to look at how Brazilian music is hitting the mainstream, how YouTube makes the superstars of tomorrow, and how songs get written. Speakers include Anuel AA, Lele Pons, Rudy Mancuso, Michael Huppe, Rudy Mancuso, and more. Billboard Latin Music Week sets out to chart the future of Latin music in the US.